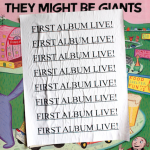 They Might Be Giants have a gift for you! The entire first album recorded live on the 2013 tour! Danny Weinkauf on bass, and Marty Beller on the drums. There is also a guest appearance by the Avatars of They. They Might Be Giants’ first album, also known as the “pink album” because of the distinctive pink skyline in Rodney Allen Greenblat’s cover illustration,” was a turning point for both the band and the burgeoning world of indie rock.